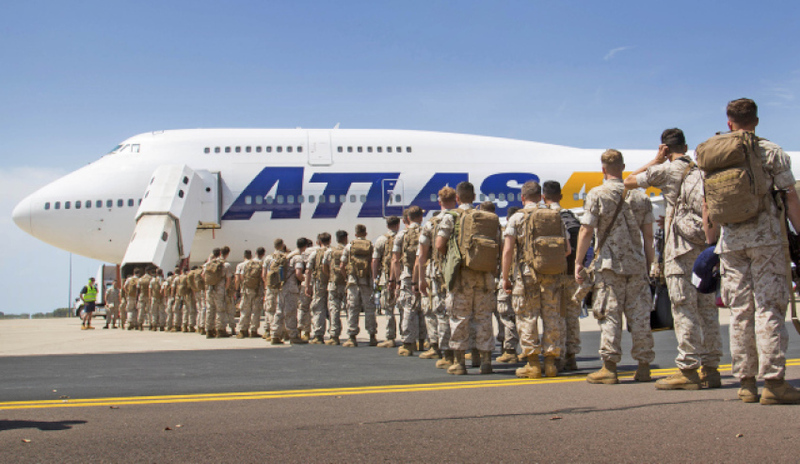 Members of the United States Marine Corps from Marine Rotational Force - Darwin 2017, prepare to board an awaiting aircraft at RAAF Base Darwin, Air Movements Section as they depart Darwin for the final time. Image via Commonwealth of Australia, Department of Defence. The 2017 Marine Rotational Force-Darwin (MRF-D) has begun its departure from Darwin, bringing the sixth rotation of US Marines through northern Australia under the United States Force Posture Initiatives (USFPI) to an end. This year’s force rotation involved 1,250 US Marines and an Aviation Combat Element (ACE) consisting of 13 aircraft. Deputy Commander of Northern Command Captain Bryan Parker said the ACE included four MV-22 Ospreys tilt-rotor aircraft for the first time, in addition to five AH-1W Super Cobra helicopters, four UH-1Y Venom helicopters and a range of other equipment. "This year’s rotation was a significant milestone for the USFPI program, and the advanced MRF-D 17 Marine Air Ground Task Force was a clear demonstration of the ongoing commitment Australia and the US have to achieving the objectives of the Force Posture Initiatives," CAPT Parker said. "Throughout this rotation, we saw increased capability and flexibility of the MRF-D and the Australian Defence Force (ADF) to operate together on broad range of combined exercises and training activities." These exercises provided an opportunity for US Marines and the ADF to interact with a range of countries, including China, Indonesia, Japan, New Zealand, Malaysia, the Philippines, Singapore, Thailand and Vietnam. For the first time, Australia and the US exercised as a combined force how they would deploy humanitarian assistance/disaster relief assistance on land and sea to a remote location. The exercise also reinforced the clear benefits of a joint Australian-US approach to natural disaster events, Defence said. “Australia’s alliance with the United States is our most important defence relationship and remains central to Australia’s security," CAPT Parker said. "The presence of the United States Marines across the Northern Territory plays a vital role in underwriting security and stability across the Indo-Pacific, and the Force Posture Initiatives are an essential component in preserving stability and security over the coming decades. The 2017 MRF-D is an extension of Australia’s existing defence relationship with the US that provides the opportunities to enhance practical military co-operation and interoperability and contributes to strengthening security in Australia and throughout the Indo-Pacific region.